Sophie Abrams has been leading a study on food waste on the Vineyard called Island Food Rescue. An Islandwide food-waste study is entering the home stretch, with a final report expected in April and an expanded pilot project envisioned for the summer. 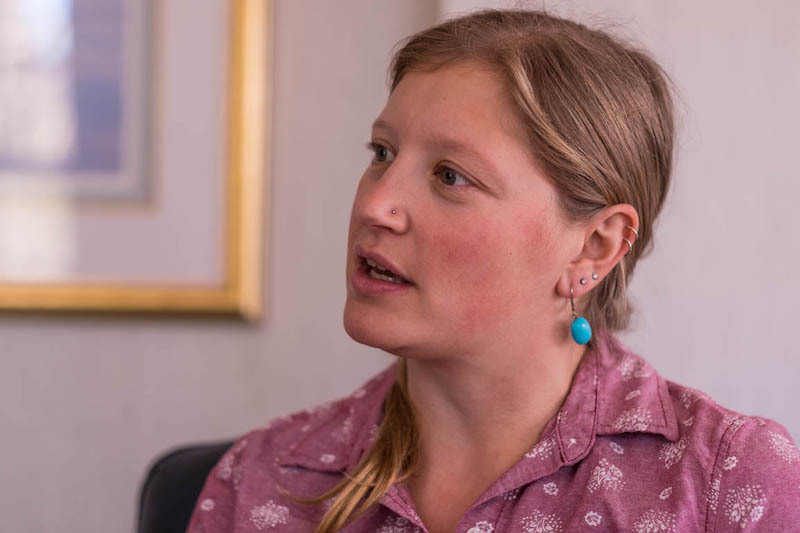 Sophie Abrams of West Tisbury, who is leading the study, said this week that managing the Island’s food waste throughout the year would likely boil down to an increased capacity for composting, and recycling in the form of animal feed. But many questions remain, including how to get more establishments onboard with a composting program, and whether a centralized composting facility would be more feasible than a distributed network. The study began last March with funding from the Martha’s Vineyard Vision Fellowship, and will provide a starting point for future management. As part of the study, Ms. Abrams helped launch a pilot program last June to collect food scraps from six down-Island restaurants, later handing the program off to Island Grown Initiative. The pilot program collected 32,844 pounds of food waste as of the new year, and Ms. Abrams hopes to double the number of participating restaurants this summer. A statewide ban on commercial food waste was adopted in 2014, but has yet to be enforced, due largely to a shortage of organic waste facilities. 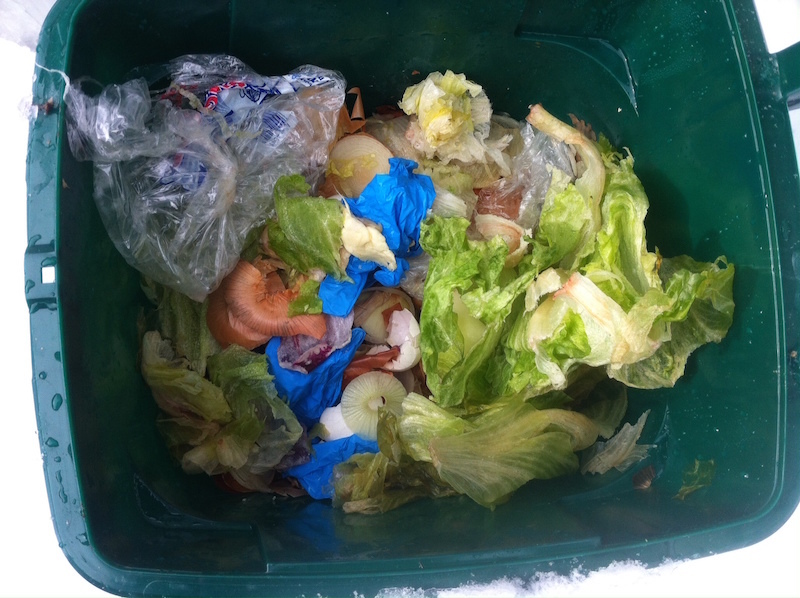 The Island study was at least partly in response to the ban, which applies to all establishments that produce more than a ton of food waste during any one week of the year. The ban may eventually extend to smaller businesses and residences as well. The pilot program, now called Island Food Rescue, has been a central feature of the study, with employee Sakiko Isomichi and an intern at the Martha’s Vineyard Shellfish Group transporting food scraps from the Island restaurants to Morning Glory Farm in Edgartown to be composted. Empty shells are brought to a separate site in town, eventually to be returned to the water, where they provide new habitat for shellfish. Art Cliff Diner, Not Your Sugar Mama’s and Wolf’s Den Pizza in Tisbury, along with the Harbor View Hotel in Edgartown, recently joined the program when other participating restaurants closed for the winter. With Morning Glory Farm closed for the season and not currently accepting compost, the scraps now end up at a farm in Oak Bluffs – only the second on the Island to be certified to accept compost from the community. Last year, workers collected almost 3,000 pounds of food waste over four days at the Agricultural Fair in West Tisbury, in addition to smaller events in Chilmark and the annual Living Local Harvest Festival in the fall. A single wedding in the summer produced about 500 pounds of compost. Ms. Abrams highlighted events and weddings as areas for further study. “There are hundreds on the Island every year,” she said. The study initially aimed to provide an estimate for the total amount of food waste shipped off-Island every year, but the number has proved elusive. The Martha’s Vineyard Refuse District reports that of the 10,000 to 12,000 tons of garbage it ships off every year, about 45 per cent is food waste, but that does not include Oak Bluffs and Tisbury, which form their own district. Ms. Abrams said both districts have shown at least some interest in providing composting facilities, and she planned to further explore the possibility. She had yet to identify locations for a central composting facility, but suggested that might not be the best approach in the end. “What seems to naturally happen is this kind of network of smaller sites popping up,” she said. But regardless of the final recommendations, she believed towns would need to work together, given the two refuse districts and the distribution of establishments across the Island. Food waste can also be used as animal feed, although Ms. Abrams pointed out that pigs may not be fed post-consumer waste, such as food scraped off a plate in a restaurant, unless it is heat-treated first. She added that food waste can be processed into a dry meal and safely fed to pigs, goats, dogs and other animals. “Animal feed and compost are both valuable products that we are shipping onto the Island that we could potentially be producing here,” she said. Another strategy called aerobic digestion, which is similar to what occurs in septic tanks, is unlikely to make the final recommendations, she said, since the Island lacks certain infrastructure. She recalled visiting the Crapo Hill Landfill in New Bedford, where Tisbury and Oak Bluffs send their waste, and seeing an anaerobic digester that processes liquid food waste as part of a waste-to-energy plant that is powered by methane from the landfill. She noted the absence of both a power plant and similar methane source on the Island, but said smaller digesters might still make sense for individual businesses. Some have noted that food waste contains nitrogen, which can fuel harmful algal blooms in saltwater ponds. But Ms. Abrams argued that composting and other strategies on the Island could mean less compost coming over on the ferries, and possibly a net-zero gain. “That’s definitely still a big piece that we are looking at,” she said. One goal in the coming weeks is to sharpen the focus of the report so those involved in the next steps — whether it’s individual towns or private entities — will be aware of their roles. But Ms. Abrams said it was only a matter of time before Island establishments would have no choice but to comply with the ban. I assume the Island Food Rescue is the continuation of Island Grown Gleaning, and that it has no website or facebook site? Hi Andrew, Thanks for asking! Island Food Rescue is a separate program from Island Grown Gleaning, but both are part of the Island Grown Initiative. We only have a Facebook page right now https://www.facebook.com/islandfoodrescuemv/ but are working on getting a page up on the Island Grown Initiative's site. What about allowing homeless and the needy families and individuals and the elderly and handicapped to dine at the local buffet food restaurants such as the bite at the shell station in vh and tropical restaurant at five corners, Sophie's in Edgartown and the hospital dining facility not to mention the public school system . All of the food establishments could offer free hot meals to anyone in need throughout the year at closing time before the hotel pans hit the dumpsters it is truly a shame to waste all this fine food on pigs and composting . People first animals second and then compost for fuel and gardening . We need to get our priorities straight .we should also consider the vast amounts of ediblefood and copostable food being wasted by stop & shop and cronies market much of the dated and culled foods are perfectly fine for human consumption and should go directly to the food pantry on church street not the dumpster compactors where they are currently going any other more spoiled products would be prime candidates for pigs and other livestock and the rest can be composted or used to produce fuel none if this massive volume of food waste should be shipped away as garbage and can and should all be utilized properly there is no excuse for this gross waste of valuable resources!! !